Run out of idea for dinner tonight? 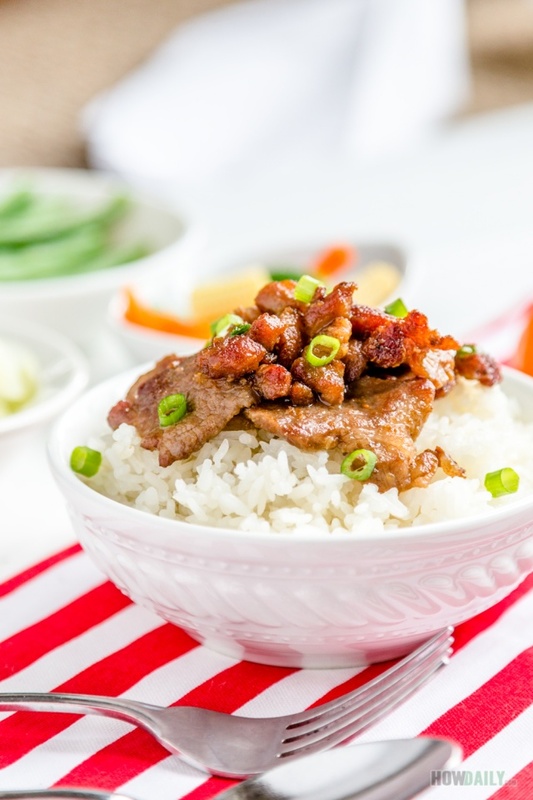 Try this simple, yet delicious full meal plan with salty-sweet pan-fried pork, boiled veggies and a savory soup along with some white rice. They are just so delicious altogether that you’ve better watch out for running out of rice. Better yet, they’re quite easy to fix and ingredients are available at any grocery store too. This is a typical Vietnamese meal: a salty dish, veggies, soup, and white rice. So if you have a rice cooker, get it out and let it work for you. You can also steam veggies (I used green bean & cabbage) in rice pot as well, but I prefer to boil them, so that the boiled water (now vegetable broth) can be turned into simple soup. It is far simpler than you think, just throw bag of frozen chunks vegetable or carrot, season and sprinkle some cilantro and ground pepper. 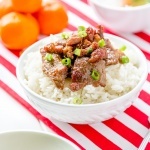 For the main dish which is pan-fried pork w/ onion, it should require no prior marinade at all. You also could use soy sauce instead, the taste will be differ a bit, but still super delicious and rice demanding. 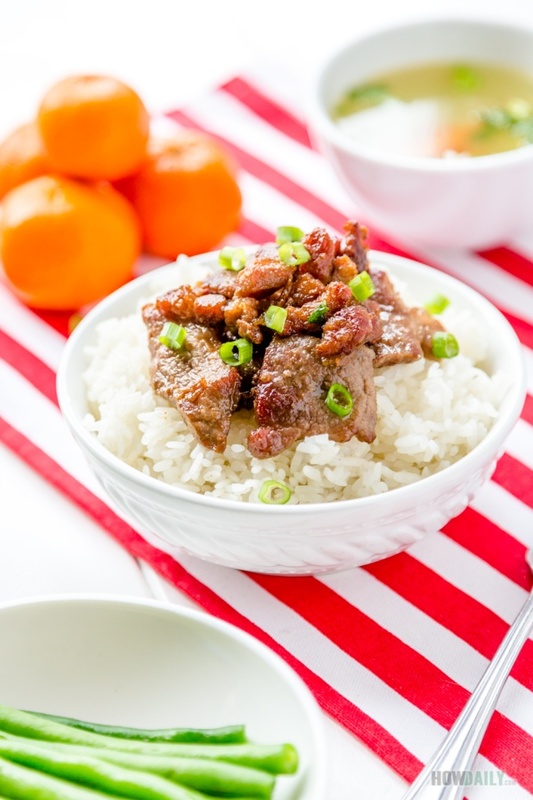 You’ll see, a for good pan-fried pork dish, pork meat should be a bit crisp and fully coat with a layer of salty-sweet flavor while the inside remain tender and juicy, kind of like that smoky infused BBQ. Then there are the smaller bits and pieces of crispy fat chunks and shallot – also coated, which you would dip your boiled veggies (why green bean is better here) in and omg – that’s just so bold and fascinating. Along the meal, don’t forget to swoop in a few spoon of soup to relieve and clean the palate, rinse and repeat – that kind of sort. To be honest, this is the recipe where you don’t have to use exact measure and following every detail. In fact, my hubby (who doesn’t like reading manual, details or mixing anything) would cook this far better, simpler, and faster than me. Thus, he always fix this for those nitpicking time, like breakfast in like 20 minutes (￣□￣;). So there, try it this winter, it just taste better in the cold though. Don’t forget to grab some tangerine or orange for dessert. Recipe for Pan-fried pork and co. 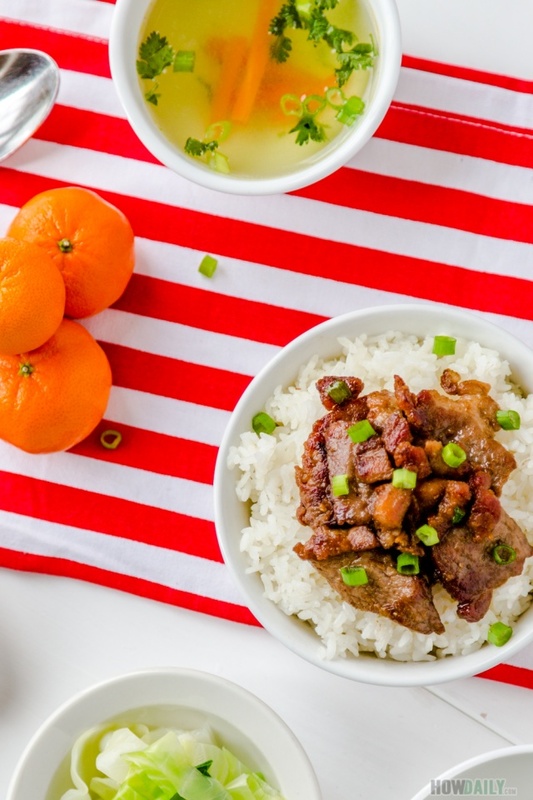 Simple and easy full meal plan with Pan-fried pork over white rice, boiled vegetable and soup, typical Vietnamese home style meal. This is a delicious quick fix that could be achieved under 30 minutes if you're good with planning and multi-tasking. Prepare and cook rice per package instruction. Bring a pot of water (~ 1 quart) to boil over high heat. Add 1/2 tsp of salt. Wash all vegetable (if any). Cabbage: Shred or cut into long thin strips. When water is boiled, add green bean and cook for 3-5 minutes until desire tender, then use a sieve to transfer them out. Still on high heat, now toss in cabbage and boil for 2-3 minutes, transfer them out to serving plate. Finally, add frozen veggies chunks, bring to boil again and season to taste. When vegetable firmness is at desirable level, sprinkle in 1/2 of chopped green onion, cilantro and ground pepper. Remove from heat, this will be your side soup. * Note that you can multitask by pan frying the pork side-by-side while boiling/preparing veggies and soup to save time. Separate any large solid chunks of fat from the meat. Cut those fat blocks into small chunk (1/2 inch cubes size). Using a large area non-stick pan over medium high heat, toss those little fat chunks in, stir to separate and void clump. While these fat blocks are melting/frying, finely chop shallot and cut pork meat into thin 1" x 2" slices. During the process, don't forget to stir those fat chunks once in a while for even frying. Once all the fat chunks shrink to smaller & crispier cubes, discard all the liquid fat. Toss in chopped shallot, stir rigorously till soft and you can scent them. Add in the slice pork, stir and spread them out evenly. Let the pork fry and become crisp/firm a bit on one side, then stir to turn them over (5-7 minutes). Add in fish sauce, sugar and 1/4 cup of water. Stir to mix well with all the meat. Keep stirring until all liquid is reduced and all the meat slices are coated evenly in marinade..
Add remaining chopped scallion, stir to mix and turn off heat. Serve hot immediately over bed of rice with boiled veggies and soup. Throwing some fruits as dessert, and voila, you have a full course meal, Vietnamese style.